Everything went right Friday night. Ike Davis' homer made it over the wall. Frank Francisco's chicken comments did not come back to haunt him. Squawker Lisa was at Citi Field and the Mets still won. Then Davis came down with a mysterious illness, Francisco went on the DL and Lisa and I returned to Citi Field on Sunday only to find ourselves in a section (507) with way too many Yankee fans in the rows just in front of us (I counted six Derek Jeter shirts and jerseys - every one of them a different design). On Friday, Nick Swisher had Davis' three-run homer bounce off his glove. On Sunday, Swisher hit a three-run homer. About the only thing Friday night and Sunday night had in common was Miguel Batista giving up an eighth-inning homer to Robinson Cano. Also, the rain picked up in the ninth inning both nights. So why did things turn out so well Friday and fall apart after that? I'd like to find a way to blame Lisa. But maybe it was getting rid of the chicken. On Friday, Tim Byrdak brought a chicken into the clubhouse. That night, the Mets had one of their best victories of the year. Then Byrdak said they needed to find the chicken a new home. On Sunday, the chicken was sent packing. Sure, I'd rather have a decent bullpen than a lucky chicken, but the Mets had their own good-luck charm and let him go. And they haven't won since. Think a lucky animal can't make a difference? Last year, an image of the Cardinals' rally squirrel ended up being part of their world championship ring. When the Mets realized they couldn't take care of the chicken, they put out a public call for some sort of sanctuary and found it upstate. But maybe they should have found a way to take care of the chicken themselves. These are wealthy ballplayers with plenty of resources. And it's not as if it's a horse. Or maybe Lisa and I should stop going to games following great Met pitching performances. We went to Johan Santana's game following his no-hitter and he got rocked. We went to R.A. Dickey's game following his consecutive one-hitters and he gave up five runs. But I keep coming back to the chicken. Terry Collins admitted last night after the game he should have brought Byrdak in to face Cano. Byrdak (Bird-ak?) - the man who found the chicken - and the man who sent it away. On Sunday night, the Mets could have used Byrdak - and the chicken. Mets vs. Yankees, R.A. vs. CC -- Who will win the battle of the initials? Listen up, Met fans -- my presence at Citi Field Friday meant nothing. Your team still beat the Yankees! So much for my so-called jinx. Now, I am about to head to your ballpark for the battle of the initials -- CC vs. RA -- but if Dickey's scoreless streak ends, don't blame me! I hope it doesn't rain tonight -- Jon and I and 40+ thousand fans had to wait out an hourlong rain delay Friday. Not fun, although at least I didn't feel claustrophobic like at the old ballparks. Speaking of which, that's when I finally felt it was time for a new Yankee Stadium -- during a 2006 Subway Series rain delay, and the hallways inside were so cramped and crowded. The last play of Friday's game, of course, was a popup. Needless to say, I was hoping to see another Luis Castilloesque play, but no such luck. That was an awful Andy Pettitte start to the game -- five runs in the first took the crowd out of the game right from the beginning -- but at least he settled down, and the Bombers even made it get close. Did the Roger Clemens verdict mess him up? Meanwhile, Clemens was at Fenway Park Friday, watching a Boston game. Good, Rocket -- stay with that old team and forget about going to any Yankee games! I noticed that Darryl Strawberry and Dwight Gooden do a "Let's go Mets" chant. Of course, I helpfully pointed out to Squawker Jon how many rings each had as a Yankee! Anyhow, as much as I like R.A. Dickey, here's hoping that CC wins the battle of the initials! Who would have thought that aside from the Yankees winning Saturday, that Charlie Sheen would be the highlight of the FOX broadcast? 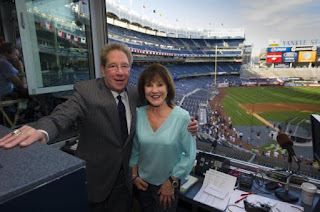 I am generally not a big fan of in-game interviews, especially on radio -- John Sterling and Suzyn Waldman had Michael Millken on a few weeks ago, and there was no way to get a clue about what was going on. But I digress. Anyhow, while I was excited to see the Yankees come back and win Saturday -- winner winner, chicken dinner -- I just find Joe Buck and Tim McCarver intolerable to listen to, with the same old stories and observations. And it figures that the one game this weekend that would have them would be the one of the three I was not seeing in person. Funny thing was, that Sheen -- a clearly knowledgeable baseball fan -- was paying more attention to the game than Buck and McCarver were. Charlie was also sober and funny and interesting. He even gave Joe Buck something to do other than the usual nonsense. Wasn't really interested in Todd Zeile, although his presence reminded me of that old joke about who bats after Zeile in the lineup. The answer -- the other team! I have to give Sheen's appearance a thumbs up. Heck, I wouldn't have minding hearing him do play-by-play for an inning or two. He would have to be more interesting than any of FOX's current broadcasters! Squawker Lisa, what happened to your jinx when we went to Friday night's Subway Series game? Did you "misremember" it, to use a word associated with last night's losing pitcher? And after your criticism of Ike Davis for hoping the Mets could just get a victory, Ike had as much to do with anyone as to why the Mets got the win, with his three-run homer. As much as I enjoyed last night's game, I did not enjoy the ninth inning. Frank Francisco is at best a serviceable closer who has no business shooting off his mouth. When he put two Yankees on in the ninth with the heart of the order coming up, I was dreading the game headline "FRANCISCO LAYS AN EGG." Instead, everything went the Mets' way for a change. Davis' ball barely made it over the wall, Jon Niese gave up two homers but still got the win and Francisco got out of the jam he got himself in. Lisa, you like to say that when the Mets win, I do the Snoopy Dance. But last night, it was the chicken dance! I'm not chicken, Squawker Lisa. Just like Frank Francisco - I've done it before. I'm referring to going to a Subway Series game with you and seeing the Mets win. Sure, it's been a while, but I've got two more shots this weekend, one with the hottest pitcher in baseball. But I'm not going to say I'd be happy with one win - I agree with you writing that Ike Davis shouldn't have said that about this weekend. But put Ike's season in perspective. Ike was hitting just .158 two weeks ago, but he's finally finding his groove and has raised his average 32 points since then. That puts Ike at .190. For a week or so now, his big goal has been to get to .200. The Mendoza Line. Maybe you'd rather hear Ike blustering about leaving Russell Martin (.205) in the rear-view mirror or vowing to make Andruw Jones (.206) eat his dust. But Ike's taking it one step at a time. Francisco, however, is, uh, counting his chickens before they hatch when he says, “I want to strike out the side against them. I’ve done it before.” As the Post notes, he did it in 2004. Not sure that Francisco should be bringing up things he did back in 2004. That was also the year he threw a chair in the stands and was suspended for the last 16 games of the season. The MLB executive in charge of the investigation was Sandy Alderson. But I do like the Post graphic of the chickens with Yankee heads on them. That could be a Subway-Series themed scoreboard graphic - the Yankee chickens slide by in a row, carnival-game style, and when a Yankee strikes out, the chicken flips over and we hear a loud ding. For this weekend, I'll predict one Met win (at a game we attend!) though I want more. And plenty of clucking from Lisa when she sees her team lose! So Squawker Jon and I will be at Friday and Sunday's Subway Series games. Sunday, in particular, looks to be shaping up as a great matchup, what with R.A. Dickey facing CC Sabathia. And just in time for the Subway Series, a Met has said something dopey and ridiculous. I am not talking about closer Frank Francisco telling the New York Post that "I can’t wait to face those chickens," and that "I want to strike out the side against them. I’ve done it before." That is terrific, because it led to a front-page New York Post "Cluck You" cover, as well as the above graphic on the Post's web site. Besides, good-natured trash talk adds to the excitement over the series. “We’d like to get a win playing [the Yankees],” Ike Davis said. Just a win would be fine? C'mon, Ike. One win out of three? That's all you're hoping for? Where's the bravado of Francisco? Come to think of it, Davis sounds like a Met fan -- or Eeyore! Squawker Jon, what say you? Care to make any predictions? Speaking of predictions, I am fearlessly predicting that my Mets-jinxing powers will lead the Yankees to wins on Friday and Sunday, the games I will be at. Of course, this prediction conflicts with my prediction to Squawker Jon that R.A. Dickey will pitch a no-hitter soon. (I see it as being like the four-minute mile -- once Johan Santana showed it could actually be done, now more Mets will do it. Combine that with Dickey's dream season, and it's inevitable.) Now watch -- Dickey will do his no-hitter against the Yanks or something! What are your predictions? Tell us about it! So let me get this straight. Now that Roger Clemens has been acquitted of all the federal charges against him involving lying to Congress, I am supposed to believe that Brian McNamee supplied Andy Pettitte and Chuck Knoblauch and even Debbie Clemens with the juice, but Clemens never let McNamee, the trainer whose salary he was paying, touch him with steroids or HGH? Really? C'mon now. It's all Roger's hard work that enabled him to throw a fastball into his mid-40s? Spare me. I am unsurprised by the verdict, and expected as much ever since Andy Pettitte backtracked on his testimony -- thanks for nothing, buddy. Not to mention that when you have not one but two people thrown off the jury for falling asleep, the prosecution isn't exactly putting on a scintillating case. It also didn't help that the jurors were picked because they knew nothing about baseball. I read and watch a lot of true crime stuff, and whenever I see a trial, I am usually aware of what the great trial lawyer Gerry Spence advises attorneys: tell a story. That means to say something understandable for the jurors to ponder. That doesn't mean spending almost two months on minutia. I was on a murder trial that took less than a week. The prosecution in the Jerry Sandusky trial managed to tell eight victims' stories in four days. Yet this Roger Clemens trial dragged on for 10 weeks, much of it due to the prosecution's inability to tell a coherent story. But the verdict isn't really a true vindication of Clemens. The thing is, my issue with Clemens at this point is more about the lying and the sanctimony than the steroids and the HGH. I think that he and Barry Bonds were both Hall of Famers before they ever touched a needle. That being said, don't give me this garbage about how it was just that hard work that enabled Clemens to pitch through 2007. Of course he worked hard -- PEDs generally don't work unless the player works out as well. But that doesn't mean he's innocent. And I hope this verdict doesn't mean he gets invited back into the Yankee fold. It already makes me vomit that Joe Torre got such cheers at last year's Old Timers' Day. Seeing Roger Clemens get such accolades will make me just as sick. As a note in preparation for the upcoming Yankees-Nationals series, I have to say that I'm digging Bryce Harper as a player, and as an interview. He gave that idiot Canadian reporter's question about drinking a beer the answer it deserved: “That’s a clown question, bro.” I'm going to start using that phrase as an answer to everything. Hear that, Squawker Jon? That's a clown question, bro! Here's the thing. Reporters ask those kinds of questions not to get a good story, but to drum up controversy. How was Harper, who is a non-drinking Mormon teenager, supposed to answer that? If he had said yes, there would have been a whole story about how Harper, age 19, thinks he's above it all. It was a total gotcha question. So Harper gave an obnoxious question an obnoxious answer. Good for him. Frankly, I wish A-Rod would do that sometimes, with some of the clown questions he gets. Speaking of which, I heard some Yankee "fans" devalue A-Rod tying Lou Gehrig on the all-time grand slam because Alex took PEDs. Everytime I hear a Yankee fan complain about that, I ask them how they feel about Andy Pettitte taking PEDs, and if that devalued his career achievements. Every single time, the fan goes into contortions to explain that Pettitte only did it once (not true!) to recover from an injury, blah blah blah. If you are going to criticize A-Rod for PEDs, then you have to do the same with Andy Pettitte, even if Andy is part of the Core Four, has five rings, etc., etc. To do otherwise makes you a hypocrite. In other news, I noticed that R.A. Dickey should have gotten a no-hitter last night, but an obvious error by David Wright was ruled to be an infield hit. That's the perfect rejoinder for those who complain that Johan Santana's no-hitter doesn't really count, due to the Carlos Beltran hit being called a foul ball. Because even though the Mets are appealing the infield hit ruling in the Dickey game, there is very little chance they will win that appeal. And Dickey will not get the no-hitter he earned last night. Speaking of which, Squawker Jon sent me an email last night about Matt Cain's perfect game, and I was about to write him back that Cain pitched a perfect game, while the Mets still do not have a no-hitter, only to remember that they do now! So thanks to Santana, something I loved to mock Jon about is done. Oh well. When Squawker Jon and I went to get on the subway after Friday night's Subway Series game, a gleeful Yankee fan spotted Jon's Johan Santana shirt and opined, "It's all fun and games until you play the Yankees!" I snickered; Jon fumed. And that was only after the Mets lost just one game. Getting swept was not exactly in their game plan! So yes, I did jinx the no-hitter for the Yanks. I'm not just a jinx for the Mets; I jinx things on my own team! Did John Sterling go back to back to back, and belly to belly to belly, in talking about the three Yankee homers in a row? He must have had a field day with it. One of the highlights of the game on Friday was when Randy Jones of the Village People was there at the game, and on camera, during the playing of YMCA. He looks fantastic! I was listening to sports radio on Saturday, and heard caller after caller complain about Nick Swisher supposedly rubbing it in with his dugout celebrating. Hmmmm, I never remember any of these Mets fans ever complaining about Jose Reyes' excessive celebrating when he was a Met! As for the rest of the weekend, the FOX broadcasts keep on getting worse and worse. Can we get Tim McCarver out of the booth already? ESPN came to its senses about Joe Morgan, but they keep McCarver in year after year. What, exactly, does he have to offer the modern fan anymore than old tired stories about Bob Gibson? Anyhow, now it's time for me to do the Snoopy Dance over the Yankees sweeping the Mets. Sorry, Jon! There was only one positive thing about attending another Met game with Squawker Lisa that ended in a shambles for my team. Lisa spent two innings on a long, slow-moving drink line because she wanted to check out the Malibu party deck and got back to our seats in the top of the sixth. She looked at the scoreboard and said, "Holy bleep, it's still a no-hitter!" On the next pitch, Omar Quintanilla broke it up. Looks like I'm not the only jinx for a change. But don't feel bad about not realizing it was a no-hitter, Lisa. Mariners pitcher Tom Wilhelmsen was on the mound when Seattle completed a six-pitcher no-hitter last night, and he didn't realize it until the Mariners catcher told him. The Mariners' catcher, by the way, was some guy named Jesus Montero. But I thought he couldn't catch, much less call a no-hitter with six different pitchers? When Josh Thole comes back to the lineup, the Mets pitched a no-hitter. When Jason Bay came back to the lineup, the Mets were nearly no-hit. As for Johan Santana, we'll always have the no-hitter. Santana actually had a better game than he did in the Bronx in 2009, when he gave up nine earned runs in three innings. At least he was said to be rusty from too much rest rather than hurting from the 134 pitches. Santana's ERA in three games at the new Yankee Stadium is now 12.21. I had no idea that Ryota Igarashi was pitching in the majors, much less for the Yankees. In 82 MLB games, Igarashi has an ERA of 6.21. And they say Brian Cashman doesn't know pitching. I had a chance to go to an event this morning featuring Terry Collins and Joe Girardi, who took questions for half an hour at the Audi Club in Yankee Stadium. The event was hosted by Dunkin' Donuts in conjunction with their new commercial starring Collins and Girardi. Both managers seemed a lot more friendly and relaxed than they often come across in their post-game interviews. Girardi asked Collins why his roster had 26 players at the moment and Collins told him it was because someone (Chris Young) was on paternity leave. Then Collins added, "When we play you, we need 26!" Someone said they saw a tweet that injured Yankee prospect Austin Romine is cleared to resume baseball activities and Girardi quipped that it was amazing how many things he learns through tweets. Later, someone mentioned blogging to Girardi, who said, "Me blog? Oh no. Tweet? No." Collins was asked about how the Mets' farm system has helped out the big club this season and he smiled and said they were going to "run out of shortstops." Both managers praised hard-working veterans (David Wright and Andy Pettitte) for setting examples for the younger players. Girardi noted that the whole rotation has improved since Pettitte came back, though also noted that along with inspiring his colleagues, perhaps the other starters were also now afraid of losing their jobs. Girardi had an interesting observation about the Subway Series. When asked about what it was like to play at Yankee Stadium with a lot of Met fans in attendance, Girardi said that now he sees what other teams feel like when the Yankees go on the road. Tonight, I'll be returning to Yankee Stadium for the second time in one day for the first game of the Subway Series. Lisa has had far more memorable Subway Series moments that I have (at least positive ones), so I'm hoping that I can be her jinx tonight for a change. Anyhow, here we are on June 8, 2012, and the Yankees and Mets have nearly the same record. The Yanks are 31-25, with a .554 winning percentage, while the Mets are 32-26, with a .552 winning percentage. Of course, the Mets are doing it on a payroll less than half the Yanks, but I digress. I'll leave that carping to Squawker Jon! But just when the Mets start looking like a real franchise this season, they do something bush league, like sell copies of the Johan Santana no-hitter tickets! For a mere $50, you can own a ticket stub. Gimme a break. I know that there is a demand for it, which is why the Mets are doing it, and they are offering free and discounted versions to various levels of season ticket holders, but I still think it's bush league. I am not going to make a whole lot of predictions for this weekend, other than to predict that some bitter Yankee fans will complain at the ballpark tonight that Johan Santana didn't really get a no-hitter. Child, please -- it's a dumb argument. I will also predict that Squawker Jon will show some bitterness, and I will show some sass! What else is new?! Jon and I were at some of the more memorable Subway Series games in recent years. We were at the Luis Castillo game, where I broke into fits of laughter afterwards, while Jon fumed. We were also at the game where Mariano Rivera earned his 500th save, and K-Rod also walked him with the bases loaded. Good times! Will something wacky happen tonight? Given that Jon and I are in the house, it's very possible! What's going on with Yankee ticket sales? Subway Series tickets are being discounted by the team! New York Yankees president Randy Levine can blather all he want about the evil StubHub somehow lowering attendance, but what does he have to say about this? Goldstar, with the full permission and cooperation of the New York Yankees, is marketing discounted tickets to the Subway Series! Yes, you heard that right. Not only is the Subway Series, usually a perennial hot ticket, not sold out at Yankee Stadium this year, but the team is having to market tickets for below face value in order to get fans into the ballpark! Right now, field level, main level, and terrace level tickets are available at a 20% discount for Friday and Sunday. These are some of the better seats in the ballpark. The tickets are going for $48-$72 for Friday, and $64-$180 on Sunday. Goldstar is a discount ticket service that works more like Theatermania than StubHub in that the entities themselves market direct tickets for their newsletter and website. For example, Squawker Jon and I went to a concert at Avery Fisher Hall last week, which had discounted tickets through the service. The Yankees have sold some of their Audi seating and other more expensive seating in the past through Goldstar, but this is the first time I have seen them market big games like the Subway Series through the service. The thing of it is, though, that this is one series where StubHub prices are being sold for above face value -- at least the less expensive seats like the grandstand and bleachers and standing room only. So it's very interesting that the Yanks are doing this for this series, but telling, in that these are pricey seats that have never moved from Yankees.com, due to lack of interest. Hmmmm, maybe the Yanks ought to realize that those seats are overpriced in the first place. Thank you, great post. I agree on every point. I had the 15-game Sunday plan for many years and loved it. Then they built the new stadium and switched my plan to a Monday-Tuesday plan without telling me. I couldn't go to most of the games, and could barely sell them for $5 on StubHub. Now they've taken all the premium Sunday games out of the Sunday plan and added 3 mid-week games, so it's not even really a Sunday plan. That, the no-post-season-guarantee thing, higher ticket prices and higher parking fees makes it a non-seller. Basically less for more. I've been contacted 3 times this year by the Yankees begging me to buy the plan. Not a chance. The unnamed Yankee official also claimed that professional ticket brokers were "shorting" the sales, and claimed that StubHub was allowing tickets to be put on sale before they were printed. Um, guys, season ticket holders know what seats they have, which is how they listed them. Why is that so difficult for them to understand? I've heard and read all sorts of horror stories about how the Yankes have messed with those with partial plans -- making their tickets worse, taking away Opening Day and Old Timers' Day, adding games they don't want, and taking away games they do want, and raising prices. Now we are supposed to believe that Randy Levine et al are just concerned about their season ticket holders? Puh-lease. There is a lower demand for tickets this year, which is why prices are dropping. But instead of examining why that is so, Randy Levine and his crew would rather come up with conspiracy theories about the evils of StubHub, the entity that has done a heck of a lot more to make reasonably priced tickets affordable and available to the average fan than the Yanks have. This is one of the down sides of being a Yankee fan -- an arrogant front office with entitled people who, at best, take their fans for granted, or at worst, screw their fans over time and time again. And we're stuck with all of them for the foreseeable future, because the Steinbrenner kids, unlike their father, never see the need to ever fire anybody. Lovely. Squawker Jon and I will be at the first game of the Subway Series on Friday. It also happens to be Johan Santana's first start after his no-hitter, so we will see if he will emulate Johnny Vander Meer and pitch two no-hitters in a row. Not very likely -- Terry Collins would have to be tied with duct tape to a pole in the dugout, the way Pedro Martinez was a few years ago, to ever let that happen! There is no way he's going to let Santana go past the pitch count again. Anyhow, I have been hearing some Yankee fans grouse that Santana didn't really get a no-hitter because of the Carlos Beltran foul ball that hit the line and should have been a hit, and so the no-hitter doesn't count because of a missed umpire call. Really, Yankee fans? C'mon now. It counts. Leave the pettiness to Mets and Red Sox fans. Let's face it -- at this point in time, the Mets are the little brother in New York baseball. Do big brothers whine like little schoolchildren when their little brothers do something good? No. They might be a little condescending about it, like pointing out how many no-hitters the Yankees have, but they don't pretend that the no-hitter doesn't exist. Regarding the call on Beltran, you can say with pretty much every no-hitter -- and every game, for that matter -- that a call could have gone the other way. That is something the St. Louis Post-Dispatch and Cardinals fans ought to have remembered when it comes to their asterisk nonsense about Santana. As Viva El Birdos 2012 Baseball Annual author Larry Borowsky noted, Bob Forsch's no-hitter for the Cardinals in 1978 had an error that should have been scored as a hit. Yet the Post-Dispatch didn't put an asterisk on it. Shocking. As Yankee fans should know, here are some of the petty examples of things that Yankee haters have griped about over the years. They are angry that the Bombers started its 1990s dynasty based on Jeffrey Maier preventing Tony Tarasco from catching Derek Jeter's postseason home run in 1996. I've heard the haters complain that Don Larsen's perfect game ended with a called strike three that should have been ruled a ball. And Squawker Jon has helpfully reminded me over the years that David Cone's perfect game against the Montreal Expos was basically against a minor-league lineup. But guess what? All of those games counted. So Yankee fans, stop it already with the "Santana didn't really have a no-hitter" nonsense, unless you are prepared to accept the Yankee haters' points about our team's triumphs. Besides, there are plenty of other things we can mock our little brothers over and condescend to them about. Like Bernie Madoff and the Wilpons. Our franchise has celebrity fans like Denzel Washington, Paul Simon, and Jay-Z. The Mets have Mike Lupica and Bill Maher. Now that's funny! Home attendance is down 3.6 percent for the New York Yankees this season, and team president Randy Levine is pointing a figure at...StubHub. Really? Not uninspiring play this year, or a bad economy, or even the prevalence of HDTV, but a ticket service? The Yanks and other teams claim tickets are priced too low on StubHub. The StubHub effect this year — combined with a lousy economy and a poorer on-field performance — has produced an average crowd of 40,949 through 25 games, compared with 42,491 last year. So having super-low-priced Yankee tickets available is contributing to lower attendance, not higher attendance? What bizarro world do they live in? Not to mention the fact that the tickets on StubHub contribute to Yankees attendance even if they are never re-sold or used; after all, they are already counted towards attendance because they have been purchased by season ticket holders. It sounds like Levine is getting business advice from the clowns who run the Yankees parking garages. They were the knuckleheads who raised the rates in 2011 to $35, instead of lowering them, when few people parked there, with even fewer people parking there now. And Levine's insinuation that StubHub is somehow not "fan-friendly" is ludicrous. Right now, there are tickets as low as $1.95 on StubHub for grandstand seats for the Yankees-Rays series, seats that retail for around $25 or so. What could be more fan-friendly than that? The StubHub effect is really that in the modern era, you can get great seats at costs much below face value, something you couldn't do even 10 years ago. When Squawker Jon and I went to a Yankees game a few weeks ago, we sat in the upper deck right behind home plate for just $8.00 each, a terrific deal for tickets with a $28 face value. But Randy Levine is mad that instead of buying tickets on Yankees.com for $28, I bought tix from a season-ticket holder for so much cheaper. Give me a break! Now, you can't always find tickets below face value on StubHub -- we just had to spend a little above face value to get Subway Series tickets for this Friday -- but you can usually find great deals there. That's because there's this weird thing going on called "supply and demand" -- something Levine doesn't understand. He also doesn't understand the whole "what the market will bear" concept. There is a deeper issue with the pricing being this low, in that there is less demand for Yanks tickets. Levine ought to figure out why that is happening instead of bashing StubHub. Look, I get that the existence of StubHub and other resale sites have contributed to fewer people buying full-season or partial season ticket plans, because now fans can find deals for most games on the resale sites But you know what else contributes to fewer fans buying such plans? When the Yankees stopped guaranteeing access to post-season tickets for those fans who bought the partial plans. Other than being able to say that you have a partial season ticket plan, there is no good incentive to do so anymore. At least the Mets offer perks for those fans who buy even the partial season ticket plans. What do the Yankees offer? I'm not aware of any. Maybe they should, instead of Levine whining about the evilness of StubHub. Here's the thing -- I get that baseball is a business, and that high food and drink prices are par for the course at Yankee Stadium. But then don't turn around and whine when fans are able to find good deals for games, and that they make the rational business decision of buying $25 tickets for $2, instead of paying face value for them. I don't know what's more disturbing -- that Levine peddles this nonsense, or that the Post uncritically reports it -- but StubHub is a great innovation for the average fan, and it's as "fan-friendly" a business that there is out there. So what is Levine's solution going to be instead of StubHub? Banning season ticket holders from reselling their tickets, like the Yanks used to do a few years ago? Forcing there to be a higher price on re-sold tickets? No matter what the Yankees try to do instead of StubHub, it is bound to result in less money for them. Because every ticket that is sold but not used means that the person will not be in the ballpark to spend money. Too bad Levine can't seem to grasp that simple economic concept. Today I am participating in a progressive game blog put together by United Cardinals Bloggers. Several Mets and Cardinals blogs will each cover an inning of today's game. I covered the first inning from the Mets' side. Pitchers Hit Eighth will cover the first inning from the Cardinals' side. I've been a Met fan for more than four decades, but today's game will be a new experience for me. For the first time, when the opposing team gets a hit, I won't think to myself, "another day without a no-hitter." Cardinal fans reading this may not realize how big a deal last night was to Met fans. You've had ten no-hitters, six since the Mets came into existence in 1962. We had none before last night. And the Mets are typically a team built around pitching that has played primarily in pitchers' parks. Not to mention the superstar pitchers who have played for the Mets. After taking three no-hitters into the ninth as a Met, Tom Seaver finally completed one the year after the Mets dealt him. Nolan Ryan went on throw a record seven no-hitters after the Mets traded him away. Gooden and David Cone not only pitched no-hitters after leaving the Mets, but did so for the (ugh) Yankees. As the Mets' latest superstar pitcher, Johan Santana, attempted to come back from an injury that the conventional wisdom said would mean that he would never be great again, one of the players traded for him, Philip Humber, pitched a perfect game. So forgive me, Cardinal fans, if I'm still basking over last night. It only took 8,020 games. And the fact that it was Santana showing he had made it all the way back makes it even sweeter. Starting pitcher R.A. Dickey had a sensational May, going 4-0 with a 1.83 ERA, 0.96 WHIP and 33 strikeouts in 34 1/3 innings. For the season, Dickey is 7-1 with a 3.06 ERA. He's become a big fan favorite since joining the Mets in 2010. This spring, Dickey was the subject of the documentary "Knuckleball," which follows Dickey and fellow knuckleballer Tim Wakefield during the 2011 season. Leadoff batter Rafael Furcal grounded out to third. Daniel Descalso struck out swinging. Then Matt Holliday came up. Whenever I see Holliday, I think back to when Holliday was a free agent after the 2009 season and signed with St. Louis for $120 million. The Mets signed the second-best power-hitting left fielder available that year, Jason Bay, for $66 million. At the time, one could argue that the Mets were making the right financial decision. Of course Holliday was better than Bay, but was he really worth twice as much? Bay has been on the DL since April 24 and few people seem to care. The Mets were 8-8 with Bay and have been 21-15 since he got hurt. Bay comes across as a likable sort who always hustles. If Bay had been in left last night, I have no doubt that he would have crashed into the wall to make the play as Mike Baxter did. Bay suffered a season-ending concussion crashing into a wall in July 2010. But as far as contracts go, Bay's helped get Omar Minaya fired. Holliday flied out to left. Dickey only threw seven pitches. I couldn't help thinking of Santana barreling past his 115-pitch limit last night on the way to 134 pitches. Left fielder Kirk Nieuwenhuis led off for the Mets. Nieuwenhuis, a rookie hitting .301, is the main reason few people are that worried about when Bay will return. Next up was center fielder Andres Torres, who is evidence that Mets GM Sandy Alderson, now in his second season, remains in his honeymoon period. Alderson acquired Torres and Ramon Ramirez for Angel Pagan. Torres is hitting .211 with an OPS of .649. It would be nice if he were simply off to a bad start, but these numbers are similar to his 2011 numbers of .211 and .643. Torres' breakout year in 2010 at age 32 looks more and more like a fluke. Now Torres is 34 and could not make it through Opening Day without ending up on the DL with a calf injury. Ramirez is also a big disappointment so far with a 4.78 ERA and 1.52 WHIP. And now there's news that he was injured during the celebration after the no-hitter. See, nothing can ever go completely right for the Mets! Meanwhile, Pagan is off to a great start, hitting .315 with an .821 OPS and 10 steals. With Torres and Dickey, the Mets do hold the distinction of having two players in the same lineup who are the subjects of new documentaries. "Gigante" is the story of Torres' struggles with ADHD. Torres tried to bunt his way on, but not much is going right for him and he bunted foul. Then he grounded out to first. Then third baseman David Wright, the face of the franchise, came up. Lost in all the excitement over Santana’s no-hitter was Wright's announcement yesterday that he will not talk about a new contract during the regular season. Last year, Jose Reyes made the same announcement and we know how that turned out. Most people around here seem to feel that the Mets will keep Wright, but you never know until it happens. Wright hit a ground-rule double to center. The Mets moved their fences in this year and it's already helped a few more balls go out of Citi Field, but they didn't move them in enough to help Wright on this at bat, as the ball landed on the warning track before bouncing over the wall. First baseman Lucas Duda walked on a 3-1 count. The Mets have become a much more patient team at the plate since the arrival of Alderson and his "moneyball" philosophy. Second baseman Daniel Murphy was up next. With players like Murphy and Duda in the lineup more for their bats than their gloves, the late innings of the no-hitter were that much more dramatic. Murphy in particular can be an adventure in the field. Fortunately for the Mets, it all worked out. Murphy flied out to end the bottom of the first. For the second inning, please go to Cards 'N Stuff. Yeah, baby, believe it! Johan Santana pitches a no-hitter for the Mets! Finally! I am happy for Squawker Jon and his fellow Mets fans that their franchise finally has a no-hitter. And I'm especially glad it was Johan Santana, one of the game's great pitchers. I even got a little teary-eyed watching it, and I have no heart! However, this means that much like I helpfully reminded Red Sox friends about 1918 before the 2004 ALCS, I now have one less thing to mock Jon about. You see, every single time an MLB pitcher has taken a no-hitter into the eighth or ninth, I always am sure to tell Squawker Jon that the Mets never had a no-hitter. You know, in case he forgot! Like when Justin Verlander nearly had his third no-hitter a few weeks ago. I informed Jon about how those no-hitters were more than his franchise ever had. I also have helpfully teased him over the years about how many ex-Mets have hurled no-hitters, making sure to remind him about how Dwight Gooden and David Cone did it as Yankees! But last night was a little different. I watched the last three innings of Johan Santana's no-hitter instead of the Yankee game, as soon as Jon called me in the sixth to tell me what was what. Jon feared that Terry Collins may pull Santana even if he were pitching a no-hitter, due to the high pitch count. I told him flat-out that there was no way that Santana was going to allow that to happen. After all, this wasn't some rookie on the mound. It was Johan Santana! I just couldn't see any way that Santana was going to willingly leave the game. There would have been blood on the mound! All teasing and trash talk aside, I really wanted Santana and the Mets to finally get that no-hitter, even if it means less ammunition when it comes to mocking my Met fan blogging partner. Until last night, the most historic thing to happen at CitiField was when Mariano Rivera got his 500th save on Mets' turf, a game Jon and I were at, and an event I love to remind Jon about, especially when K-Rod walked Mariano! Now the Mets have their own no-hitter, on their own field. Good for them. Now I will have to find something else to mock Squawker Jon about! When I was growing up, I was obsessive about not missing a Met game, not just because I was a big fan, but because I didn't want to miss the first no-hitter. I had been fortunate enough to attend Tom Seaver's "imperfect game" that was broken up by Jimmy Qualls, and while I was too young to fully appreciate what nearly happened, it helped make me look forward to when the Mets would produce a no-hitter. In the mid-70s, when the Mets were good, but not great, a no-hitter was something to look forward to. And why not? The Mets of course had Seaver, who would take two other no-hitters into the ninth, but they also had strong pitchers such as Jon Matlack and Jerry Koosman. They played in a pitcher's park. Instead, it turned into the Mets' version of 1918 or 1940, only unlike the Red Sox or Rangers, there was no "not since..." to mark - it had never happened. In recent years - the Mets haven't even come that close - no no-hitters entering the ninth since Seaver in 1975. It looked so hopeless that if you had asked me before the game what the Mets would do first - pitch a no-hitter or win a World Series, I would have gone with the latter, and it's not as if I expect a title anytime soon. As for who might be most likely to pitch one on the current team, a few years ago, I might have said Oliver Perez, who did have flashes of brilliance at one time. But that goes to show just how cursed the Mets had been in this area. I would not have guessed Johan Santana. I was just glad he was back pitching at all. Whenever I hear a no-hitter is going on, I call Squawker Lisa, but never before the ninth. Tonight, however, I called her after the sixth. I just had a feeling. Maybe it was because Carlos Beltran's ball that hit the third-base line chalk was called foul. Santana seemed in control. His biggest hurdle seemed to be the pitch count. When Mike Baxter crashed into the wall in the seventh, it looked like another omen. In the eighth and ninth, it seemed that no out was routine. Maybe they were bloops, but fielders had to run to catch them, and avoid running into overeager fill-in shortstop Omar Quintanilla. By the ninth, I thought Johan was going to do it. But I'm glad he got David Freese out and did not have to face Yadier Molina one more time. And I'm glad that Beltran's ball down the line was called foul, not just because I'm glad Santana got the no-hitter, but because I didn't want Beltran to be the one who broke it up. I thought Beltran was very underrated as a Met and I didn't want Met fans to have something else to criticize him for. I'm glad he got a good reception tonight. Squawker Lisa likes to tease me about Dwight Gooden and David Cone going on to pitch no-hitters for the Yankees. I was irritated about Gooden at the time, though after Johan became the first pitcher to have a no-hitter after missing the previous season, I have more appreciation for what Gooden accomplished. I was happy for Cone. As with Johan, Cone had come back from serious injury. Lisa reminded me how Cone was pulled after seven no-hit innings in his first game back in 1996 after his aneurysm. By the way, Lisa, do you remember who started for the Expos against Cone when he pitched the perfect game? A young pitcher named Javier Vazquez. As I rooted for Johan to complete the elusive no-hitter, I fully appreciated the grim look on Terry Collins' face. This franchise has not had much luck with injuries in recent years and they pushed their luck with Johan tonight. But as the magnitude of what Johan did sinks in, I have no doubt that Collins made the right decision. I hope I still feel that way in a few days when we find out how Johan is recovering from his 134-pitch outing. Right now, though, I am still having a little trouble believing that, after 8,020 games, the Mets finally have a no-hitter! Just added my keywords for the blog entry. "Mets" and "Johan Santana" were of course already in the label list. This entry marks the first use of the keyword "no-hitter." On Saturday afternoon, I will be participating in a "Progressive Game Blog" run by the United Cardinal Bloggers. Mets and Cardinals blogs will take turns writing about the game and about their teams in general. I will be covering the first inning along with the Cardinals blog Pitchers Hit Eighth.